Twenty years ago, Dianne Watson invented this unique product that has quickly become a household commodity for lovers of salads and veggies! Watson tried wrapping the lettuce in tea towels. When that didn’t work very well, she did some research and discovered a special grade of cotton that absorbed water rapidly. She turned it into a sack with a drawstring and discovered that it would keep an entire head of lettuce fresh and crisp for more than a week! She also observed that it kept salad fresh for 3 to 5 days without going brown or wilted. Since then, her Burlington, Ontario, company, Lakeshore Enterprises, has sold hundreds of thousands of the Salad Sacs , which come in two colors, green and white. “Most people buy green,” Watson said. “They associate it with salad." It works with other vegetables, too. In fact, people often buy several – one for making salad, another for storing whole heads of lettuce and whole vegetables, and one for mushrooms, Watson said. Watson has even won awards for the product’s packaging. “It’s a clear poly bag, rolled and tied very attractively,” she said. "Not only does it have an instruction tag for shoppers to read it, but the bag itself has a label sewn on with instructions." About 75-80% of her customers are in the U.S., though she has customers in Europe and in Canada as well. Her first customer was a gourmet grocery store in Burlington with a cooking school. “They took it into the store and it did really well, actually,” she said. In fact, the store is still a customer after 15 years. 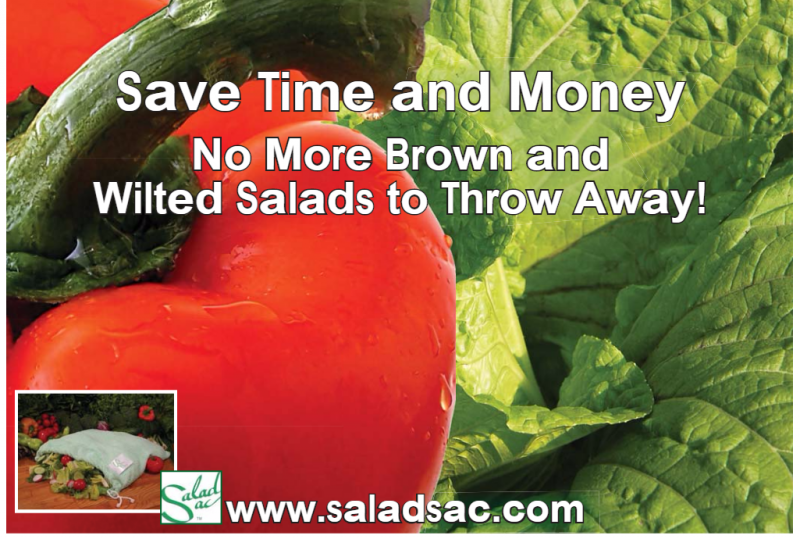 Salad Sac has been featured on Home and Garden television, as well as on a major daytime talk shows like Oprah Winfrey!